The ease of moving around in a mobile home can be nice, but it means subjecting an RV to stresses that may lead to repairs in order to maintain a sturdy presence for the vehicle. While some of those fixes mirror what the typical homeowner goes through, there are many others that are unique to the surroundings. There’s leaky roofs, loose wall panels and assorted cracks that inevitably come with age and the usual wear and tear. That means finding an adhesive that can quickly address these issues. 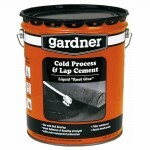 One of the simplest to use in this category when it comes to roofs is cold process adhesive. The beauty of using this product is that it can offer added waterproof coverage of an RV while also helping bond sheets and roll roofing. Best of all, as an asphalt-based adhesive, a cold process adhesive is fiber-reinforced, brushable and can be applied in liquid form without any heating. All you need is a clean surface, free of rust and any loose material. Generally, the best time to apply it is when there is no rain in the forecast for the next two days. Also, it the temperature dips below 50 degrees, the product will work best when it gets past that threshold. Depending on how much is needed, the usual coverage is approximately between 40-45 square feet for every gallon used. The problem with finding the right cold process adhesive is that it may not be available at the local hardware store. Even a specialty shop may not employ knowledgeable sales staff that are equipped to grasp a customer’s situation. That puts the RV owner or someone putting together one in a bind. However, there’s an easy answer with Basic Components, which has the product available for order on its website.